Healthy farmland is a microcosm of a heathy ecosystem; an abundance and diversity of life above and below the soil helping to make nutrients available to plants, ward off pests, pollinate crops, and contribute to the local food web. As the average farm size has grown, there has been a decline in both the quality and quantity of habitats that host farm ecosystems. Other farm practices like broad herbicide application and the reduction of flowering plants have also had negative impacts on beneficial native insects and honey bees. Headwaters Farm serves as a demonstration site for several approaches to restoring on-farm habitat. The most prominent of these is the restoration work being done in the Dianna Pope Natural Area. This undisturbed area has great habitat and forage value to beneficial insects and is relatively close to the farmland. However, other habitat work is being done within and directly adjacent to fields actively in production. In partnership with the Xerces Society, EMSWCD is developing three defining habitat features: pollinator meadows, hedgerows, and beetle banks. 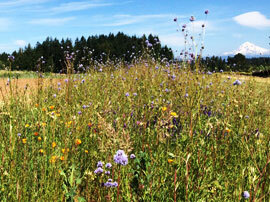 Pollinator meadows provide food and shelter to pollinators throughout the year, as different flowers bloom in stages. The area also benefits nearby crop yields! This pollinator meadow was developed in partnership with the Xerces Society, an organization that protects wildlife through the conservation of invertebrates and their habitat. 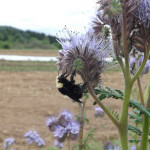 A bumble bee visits the phacelia bordering fields at Headwaters Farm. Native hedgerow planted along the border of the pollinator meadow at Headwaters Farm. Pollinator meadows are sown with various plants that attract and provide food for native pollinator species, like bumble bees. The goal of a pollinator meadow is to have plants that bloom at different periods throughout the season, ensuring that good forage is always available. 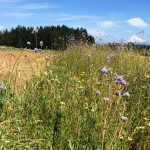 It is often more difficult to establish pollinator meadows on organic farms because weeds, grass, and other competition must be removed without using herbicides. 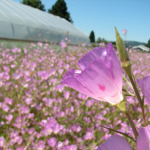 For Headwaters Farm, the chosen non-chemical establishment method was solarization , which consists of using clear plastic to heat up the soil to the point of killing weeds and their seeds before planting the pollinator meadow. Native hedgerows around the farm are typically linear plantings of shrubs, forbs, and ground covers that create habitat and forage for beneficial insects and birds. They can also improve soil permeability, reduce erosion, provide windbreaks and be useful for marking boundaries. 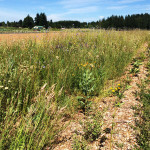 At Headwaters Farm, a native hedgerow has been established using cardboard and woodchips to suppress grasses and weeds. Native species were planted directly into the mulch. Beetle banks are raised areas of earth that have specific grasses and also sticks, rocks, or other features that provide sanctuary for ground-dwelling beneficial insects. For the beetle bank at Headwaters Farm, the EMSWCD used a tractor-mounted bed shaper to raise a 150ft strip of soil, which will be planted out with the appropriate grasses and a selection of farm debris in the upcoming weeks. Ideally, there would be vast areas around farms dedicated to beneficial insect habitat. Unfortunately, most farms have limited land to make available for such purposes. Having a suite of options to support beneficial insects increases the likelihood for small habitat additions across many farmscapes, improving yields and the viability of these important farm companions. 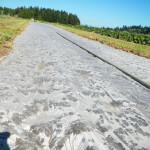 Solarization involves using clear plastic to heat up the soil, killing weeds and their seeds before planting the area. During spring, mow, till, rake, or lightly harrow the chosen site to reduce vegetative cover. Smooth the soil surface and rake off debris, if necessary. Irrigate or wait for a good rain. Cover the site with clear, heavy UV stabilized plastic (recommended 6 mil or higher). Use soil to bury all the edges of the plastic, holding it down against wind and also trapping in heat. Leave plastic for two to three months (or until cooler conditions warrant removal). Remove plastic and, without disturbing the soil, broadcast the seed blend and leave to germinate over winter (Here are Xerces Society resources for determining a good plant mix). The following growing season, hand pull encroaching weeds as needed while avoiding unnecessary soil disruption.